Newbie here and getting a first challenge. I would like to audit one of our file servers but the error " Cannot establish a connection to a Compression Service" keep registering in the Auditor server. See attached screenshot. The file server is running on Win2012, is also an AD controller and DFS server (DFS continue to work). The Auditor server is running on Win2012 R2 and is a member server. .Net 4.5 is installed on both servers. 1) Stop "Netwrix Auditor Application Deployment Service"
3) remove the content of "C:\Windows\SysWOW64\NwxExeSvc"
4) Allow the compression service to re-deploy. I realised this is the only file server having this issue so I just decided to restart it and funny enough it fixed the problem! I'll consider your suggestion next time. 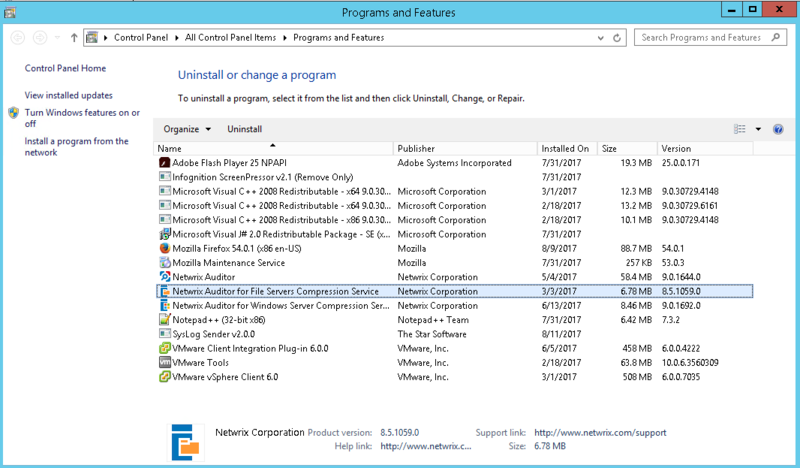 Windows could not start the Netwrix Auditor Application Deployment service on Local Computer. Could you advise what you mean by "allow the compression service to redeploy"? Do you mean run the update again from the Netwrix Auditor console? We're on version 9.0. Our file server is 2012R2 but does not share it's VM with AD or other services, like the original poster. The software needs the .net 3.5 framework being that .net 4.5 is not backwards compatible ( and the default for the OS you noted) with this service. Could you confirmed this is installed on the host? Does the account being used to communicate with the Services have local admin rights? If the Netwrix Auditor Application Deployment Service is not removed via administrator CMD use the sc stop NwxExeSvc then sc Delete NwxExeSvc to remove the service. On the next collection it should be reinstalled providing the requirements listed above have been met. We have since removed and allowed the redeploy of the service as suggested. We also changed the number of shares monitored - this server had approximately 12 shares and we've since changed the scope. The error hasn't recurred.